Chatting to Julian and Brooke from Melbourne's Whisky+Alement at the Suntory Launch recently, Jules mentioned having a pretty busy June. When I received the following press release from the National Trust of Victoria, I saw what he meant! The bar is teaming up with the National Trust of Victoria for a number of exciting events. If you're in Melbourne in late June, some of these would be well worth checking out. 5.30pm for a start 6.00pm until 8.30pm. 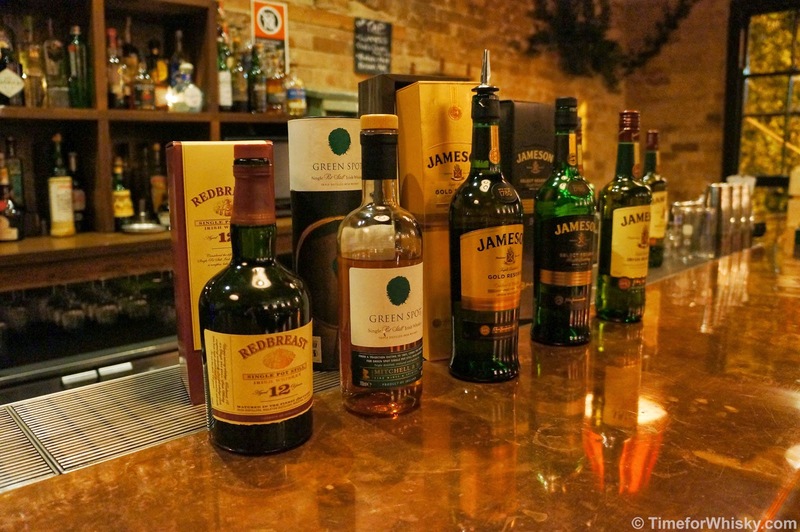 A tasting of 6 very rare whiskies will be served at Tasma Terrace boardroom taken from 4 private collections.Presented by Whisky expert, Whisky and Alement bar owner/operator Julian White. 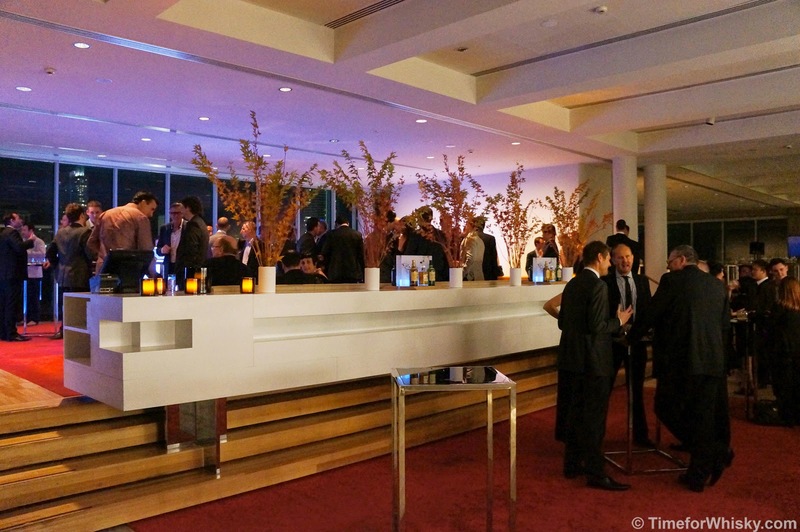 The night will begin in our prestigious Heritage room with a welcome speech by the CEO of the National Trust of Australia (Victoria), the whiskies with a collective market value of over $5,850 will be sampled. 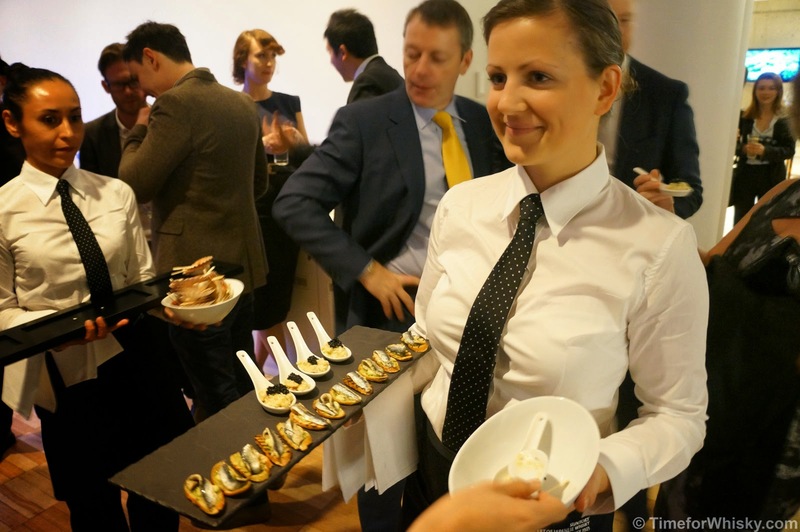 Canapés will be prepared by CNK food design. The Melbourne Gaol will be transformed into an American style whisky bar like no other. With more than 12 small bars, each representing a whisky , wine or beer brand. Ticket entry includes 2 drinks from a selection of whiskies, cocktail, wine or beer, a food dish created by CNK food design and a live band. Additional food and drinks will be available to be purchased on the night. Meet our local whisky legends including Mark Nicholson (Lark), David Vitale (Starward) and David Baker (Bakery Hill) over dinner. 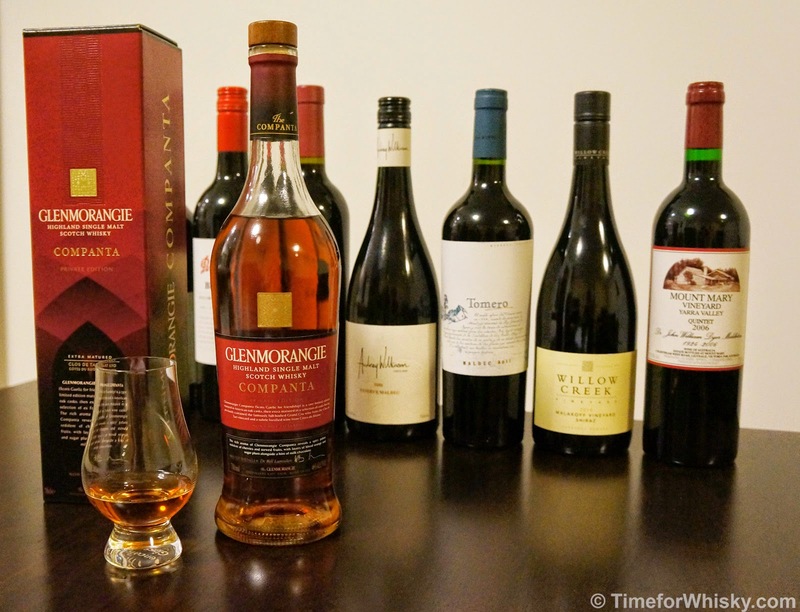 An extremely rare chance to taste and compare 8 Australian whiskies from our fast-growing local industry. In March this year Sullivan’s Cove single malt was awarded the best single malt in the world over its well-practiced Scottish siblings. In April, Lark Distillery was awarded a gold medal for its single cask single malt whisky. The industry which was founded in 1992 by Bill Lark and is growing exponentially in both size, quality and reputation. This is an opportunity to hear and taste the story from the beginning to where it is today. Ticket includes a whisky and canapés on arrival, 8 Australian whiskies each from different distilleries, a 3 course dinner created by Peter Rowland catering and a full presentation by leading distillers. A silent auction will take place over the course of the night. If you have any questions please call the National Trust Bookings Office on 03 9656 9804 or email bookings@nattrust.com.au. Please note these events are restricted to those aged 18 years and over (excluding "Whisky on the Lawn"). Please drink responsibly. " 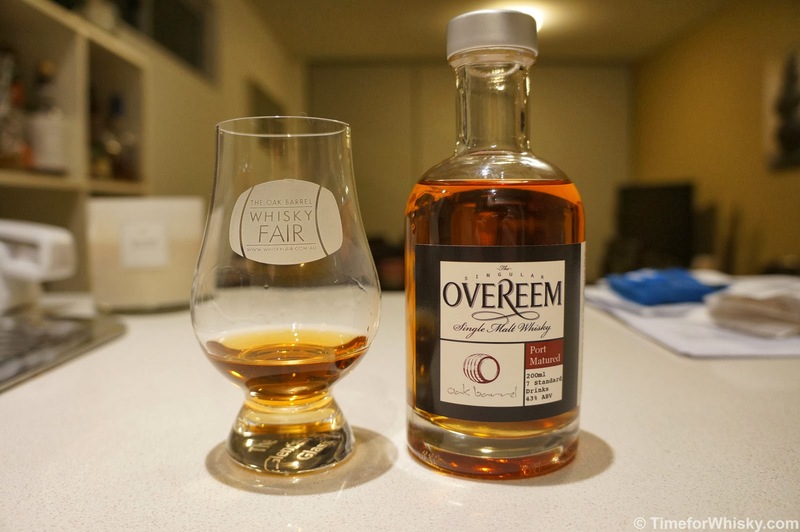 Tasted (and loved) back in January, the Overeem Bourbon Cask whisky has now been released as a Cask Strength (60% ABV) whisky, from a 100L first-fill American oak barrel. 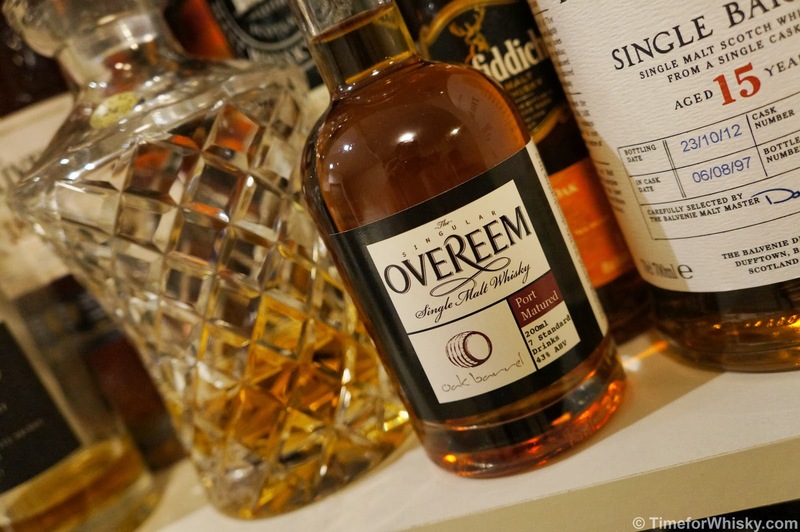 Only 111 bottles are available in this first release, at $259 in a special gift box with two Overeem Glencairn glasses. Enquiries / orders can be made by contacting Jane Overeem at info@oldhobartdistillery.com or 0418 399 077. A few months ago Steph attended the launch of Wild Turkey Spiced in Australia, an island themed event held at Campari's HQ in Sydney. I couldn't attend, but Steph brought home a sample which I tried a few days later. Nose: Nutty! Hazelnuts, toasted chestnuts. Interesting, intriguing. 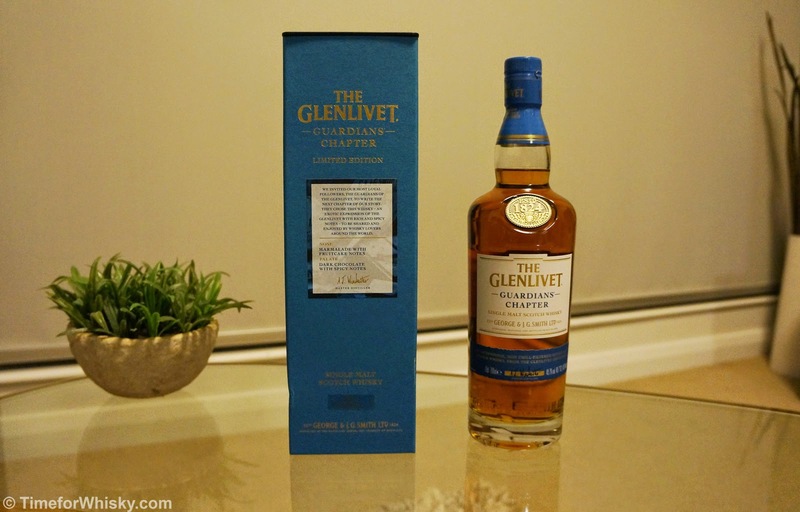 Palate: Rich and mouthfilling, similar nuttiness to the nose. Spice hits at the back of the throat, but pleasantly, softly. This is turning out to be better than expected. Finish: Short and nutty, but rich and creamy too. Wow, this has been an enjoyable whisky! Rating (on my very non-scientific scale): 91/100. Fair to say, better than I expected. As recommended, I also tried it with cola, which produced a creamier, nuttier drink with less vanilla and more chestnut notes than your average bourbon and cola. Probably one of the best Bourbon and colas I've had. 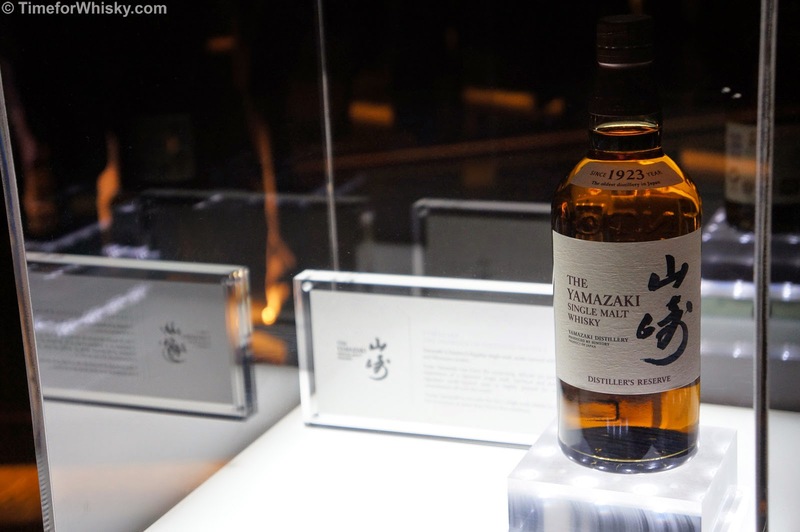 While the Yamazaki 12 has been readily available for some time now, and a few others often found at specialist bottle shops, the event was to celebrate their official launch in Australia, and no doubt heralds a significant rise in their prominence both on and off premise over the coming months. Being a huge fan of the Suntory whisky portfolio, this I can assure you is fantastic news Australia. 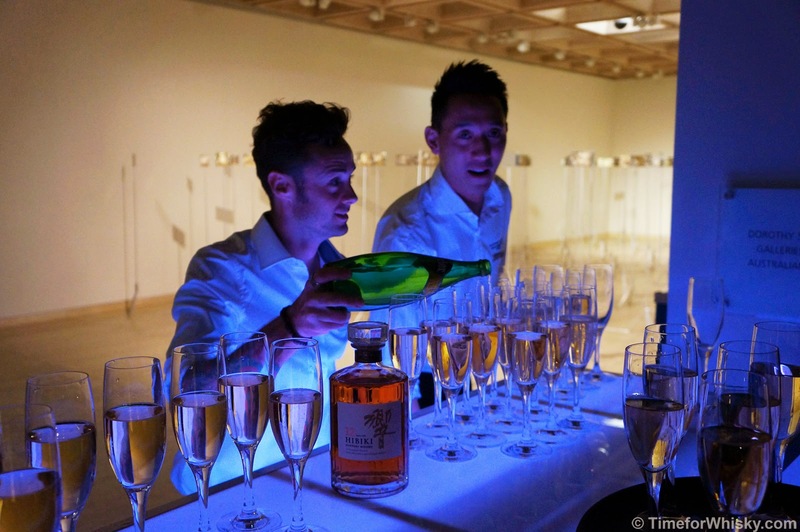 The night started with a Hibiki 12 and Perrier (the sparkling water, not the Champagne) in a Champagne flute, while guests mingled around art works and Suntory whisky displays (which some may argue are works of art themselves (especially the Hibiki bottles). After a short while, we were ushered into another room where a formal tasting was to be held by Mike Miyamoto, Suntory's global whisky ambassador. 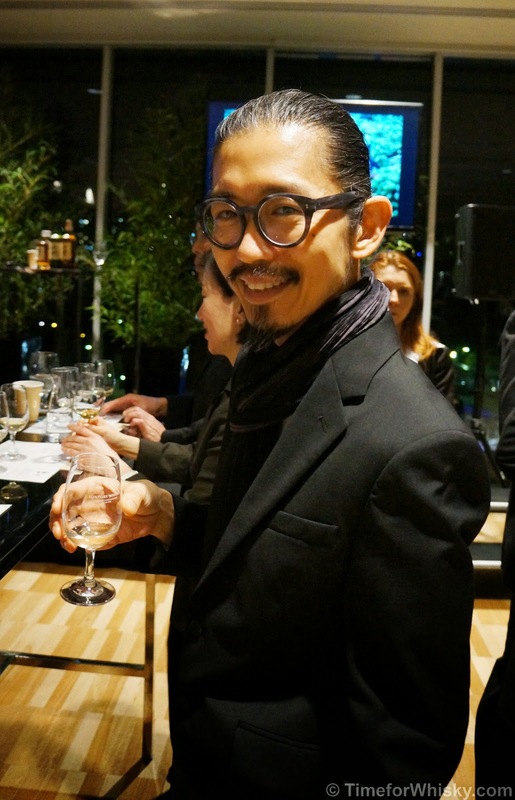 After managing to snare a lucky spot towards the front, I found myself standing next to noted fashion designer Akira Isogawa, who I learnt will soon have an upcoming collaboration with Suntory involving scarves and Suntory whisky bottles. Sounds intriguing (keep an eye out late July). Mike talked us through his time with Suntory (including being part of the Yamazaki Distillery for close to 40 years, and doing a stint in Scotland in the early 2000s), and gave us a brief overview of the history of Suntory, before explaining the Japanese whisky style (designed to appeal to delicate palates) and ethos - that success is people drinking and enjoying their whisky, not just winning a slew of awards (although they certainly have those too). 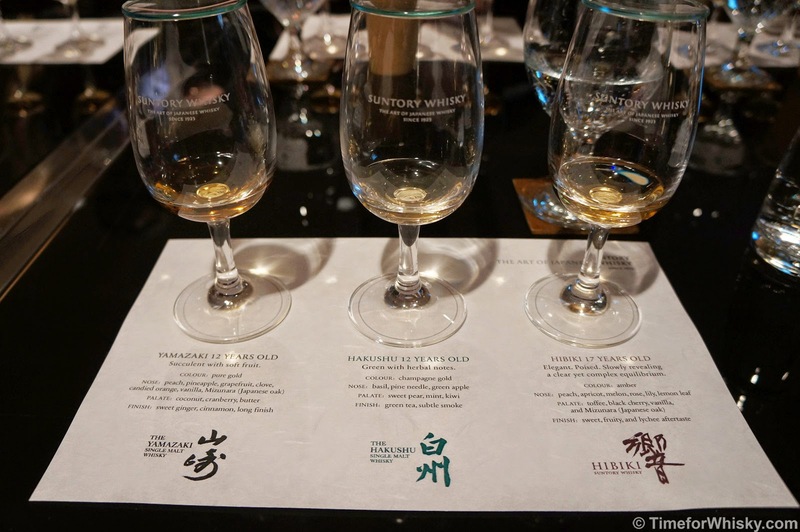 Above all, Mike explained that Suntory whiskies should be "subtle, refined yet complex", and as the tasting showed, they definitely meet those criteria. 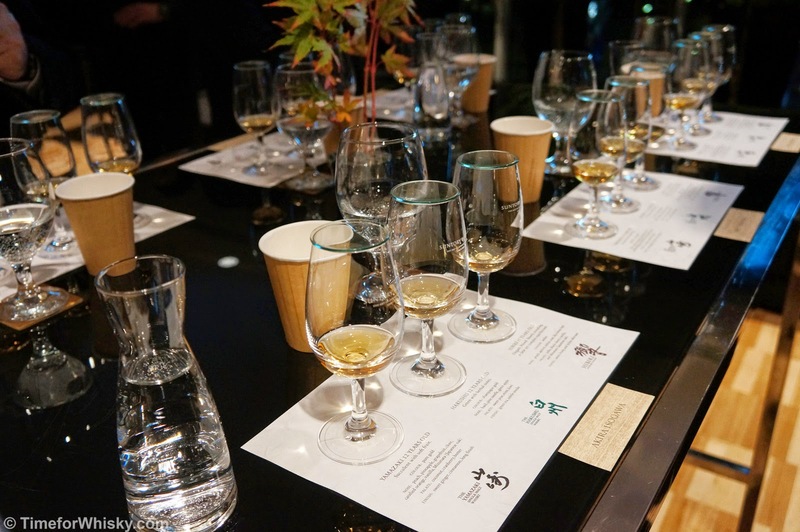 After explaining that the combination of spirit, stills, casks and wood type means that Yamazaki alone can produce 60 different whiskies, it was time to taste one, along with a Hakushu and Hibiki. Nose: Ah, an old favourite that never gets old. Honey, some pineapple, and lots of vanilla. Palate: Sweet, vanilla bean, some cinnamon, butterscotch and a hint of citrus. Finish: Long, smooth, delicate, honied. Hints of spice and possibly some ginger. Rating (on my very non-scientific scale): 92/100. A classic that hopefully will be with us for a long time to come. Also happens to be one of Steph's favourites - between Steph and I, there isn't a lot left of the bottle we have at home that a good friend recently picked up for us from Japan. Nose: Much more earthy than the Yamazaki. Green apples (in a big way), some pot purri. Very herbal. Palate: Peat smoke (light but noticeable). Bigger bite with more depth than the Yamazaki. Meaty, musty. A whisky you can sit on. Finish: Shorter than the Yamazaki. Some smoke, pears, apples and some grassy notes. Rating (on my very non-scientific scale): 92/100. 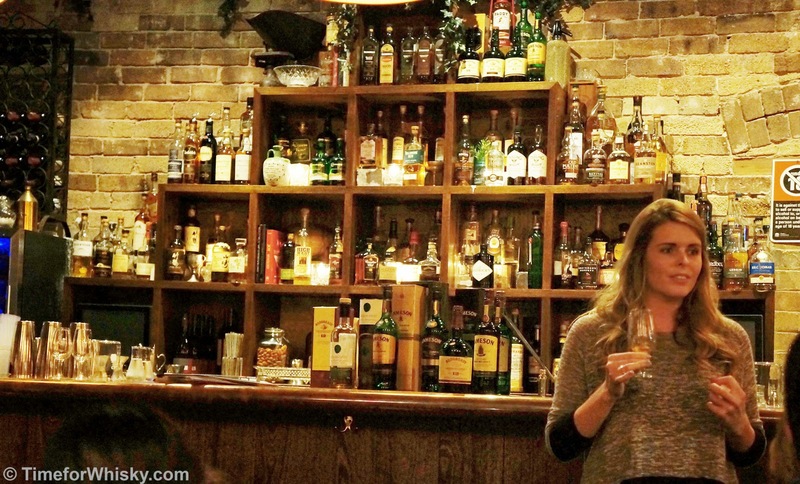 Consistently high standards, these whiskies. Nose: Heaven. Somewhat in between the previous two - sweet, but with a whole lot of complexity going on - sea water, tropical fruits, peaches and cream. Palate: As per the nose. Not terribly sweet at first, but it soon hits, with big notes of honey. Finish: Light, medium length, delicate honey notes and tropical fruits. Rating (on my very non-scientific scale): 93/100. Talk whisky around me long enough and I'll eventually get onto the topic of blends, at which point I'll usually make it known that Hibiki 17 is, in my opinion, one of the best blends in the world. This tasting hasn't altered that opinion at all - an absolutely stunning whisky, and one I very happily keep in my whisky cabinet. Later in the night we were served this with a big ice ball. 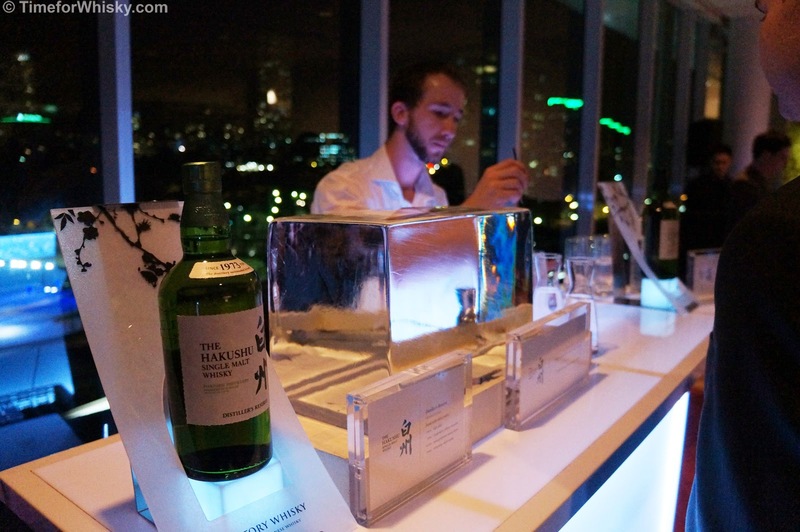 I usually prefer my whisky neat, but when you're at the launch of a Japanese whisky range, being offered an ice ball the size and clarity of which few apart from the Japanese seem to be able to manage, you don't say no. Astoundingly, by far the most dominant note from both the nose and palate was confectionary - I got Red Skins (along with Brooke and Julian from Whisky + Alement) while others (including Jonathon from The Whisky Ledger) got Gummi Bears. Fascinating, and further evidence of the amazing complexity of this whisky. 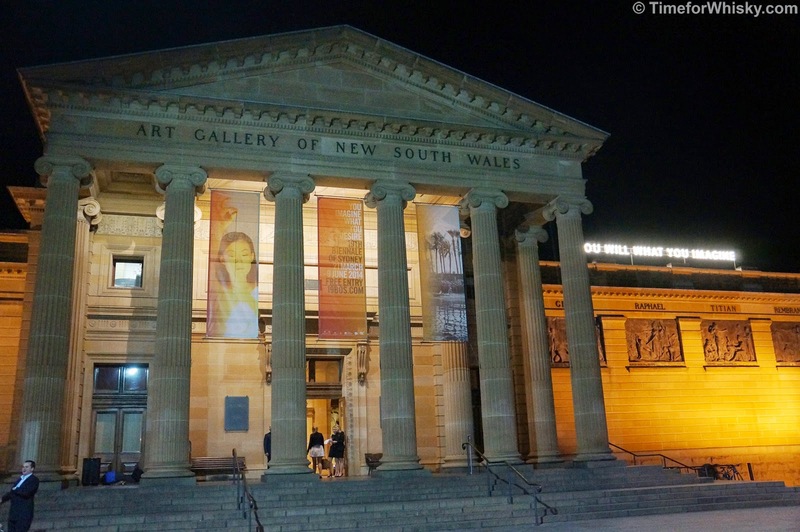 After the formal tasting, it was into yet another room for a pairing of the final three whiskies with various canapés from the Art Gallery of NSW's head chef. 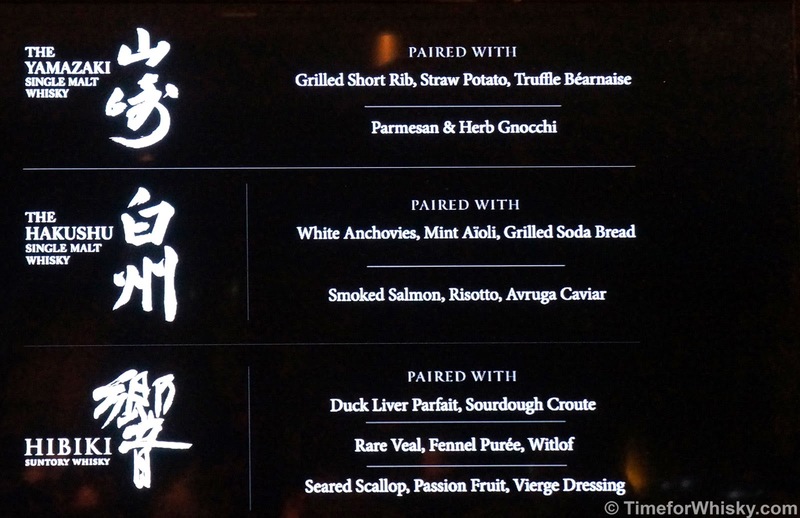 It was hard to pick a favourite, but the grilled short rib (with straw potato and truffle béarnaise) and the whisky chocolates were probably the standouts in what was a stunning overall selection. 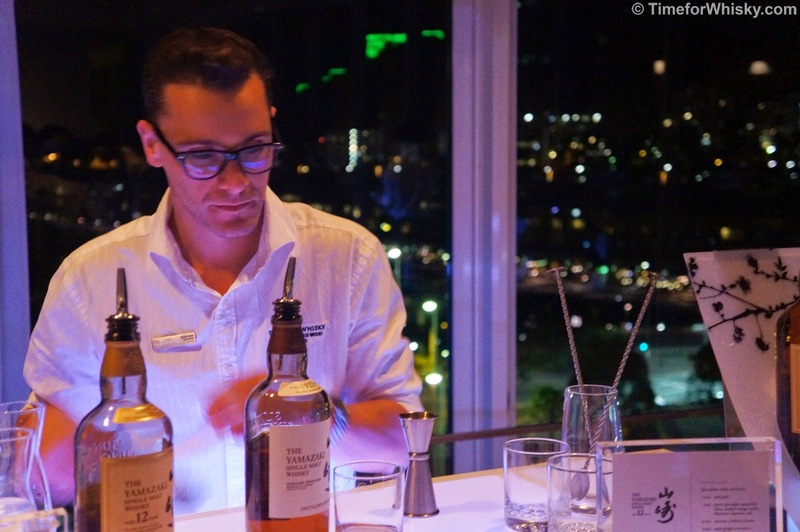 Without keeping the night too formal, matching whiskies were served in a variety of ways - from highballs to neat to on the rocks. While I don't have detailed tasting notes*, I was blown away by the quality and depth of the Yamazaki Distiller's Reserve. Here's an NAS, relatively cheap, soon to be relatively widely available whisky that absolutely bats above its $80AUD price point. One to look out for. In fact, one thing I've always said about the Suntory whisky portfolio is they produce quality whiskies at reasonable price points. 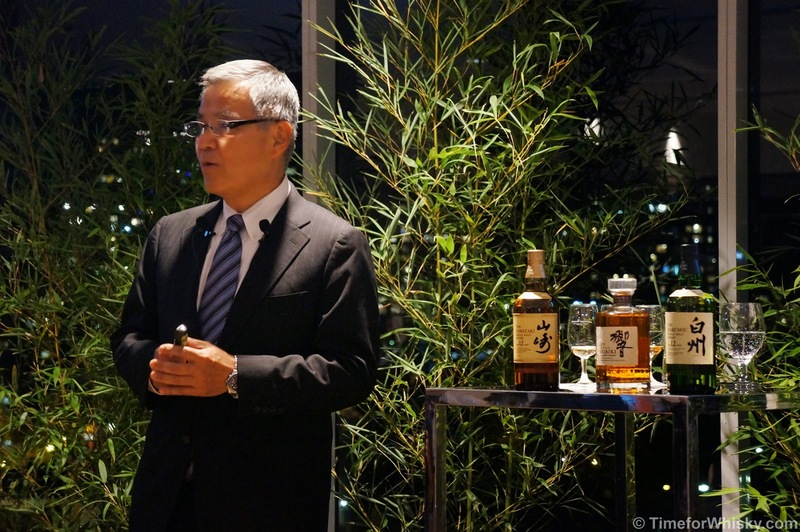 One famous guest (who'll remain anonymous) explained his opinion of the difference between the Nikka and Suntory porfolios, which was loosely along the lines of "Nikka are like the Virgin Australia of the whisky world. Decent, but nothing amazing. 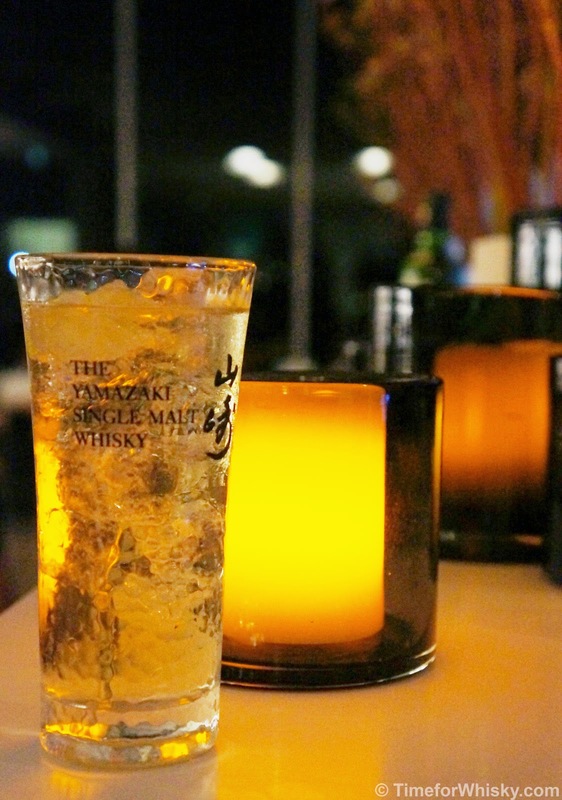 Suntory whiskies are like the Qantas - a quality experience". After a few more canapés, whiskies and much discussion (the event was packed with Australian whisky faces), it was time to call it a night (and a fantastic one at that). I predict we'll hear a lot more about these whiskies, and hopefully other parts of the portfolio (*cough* *cough*), in the coming months, and that should be music to the ears of any Australian whisky fan. As mentioned a few days ago, Glenmorangie Companta (the latest in Glenmorangie's Private Edition range) has now been released in Australia, and it's a beauty. Nose: Flint, spicy, earthy. A Glenmorangie, sure, but...unlike any other before it. Palate: Bursts onto the palate, full of flavour - very much a Glenmorangie at first, but wait, now it's tannic, full of berries, and cherries. With a slight hint of smoke. Very warming. Very unique. Finish: Medium to long, retaining the hint of smoke (just a hint) and cherries from the palate. Also introduces milk chocolate into the equation. Rating (on my very non-scientific scale): 91/100. 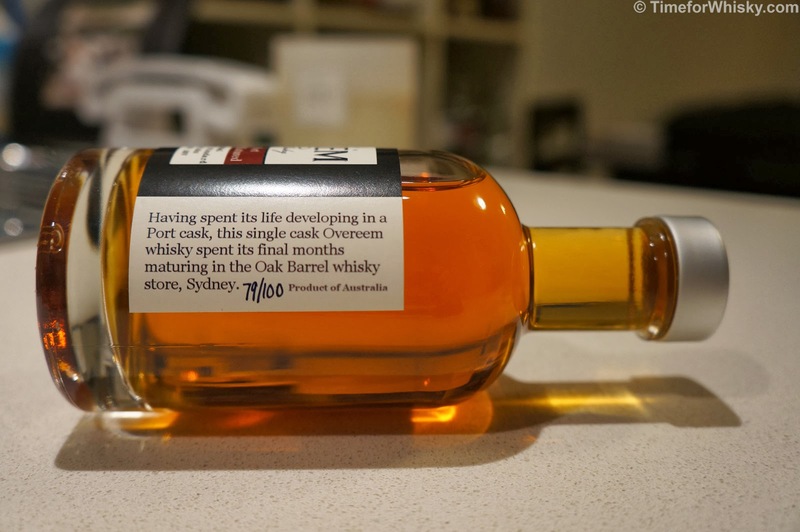 As the cold sets in around Sydney, this is a fantastic winter whisky. Warming, full of flavour, and delicious. A departure from the usual Bourbon, Sherry, or "a bit of both approach", Companta has been finished in French wine casks - Clos de Tart casks (imparting deep, berried, drying notes), then fortified Rasteau casks from Côtes du Rhône, giving it a rich and berried, but sweet profile. This isn't the first time a private edition has been finished in wine casks (2012's Artein was finished in Italian Sassicaia casks), but is the first time those wine casks have been French. 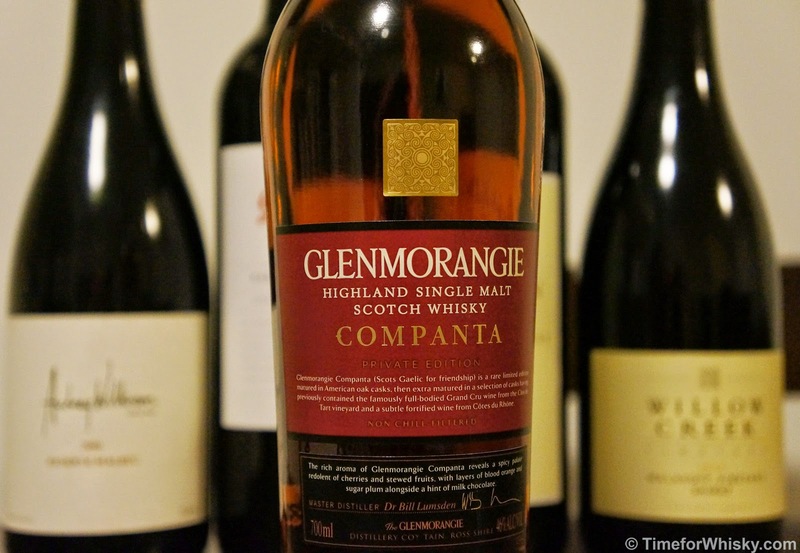 Companta is bottled at 46%, is non-chill filtered and retails in Australia for $169.99AUD. Tasting notes will be up in the next few days. 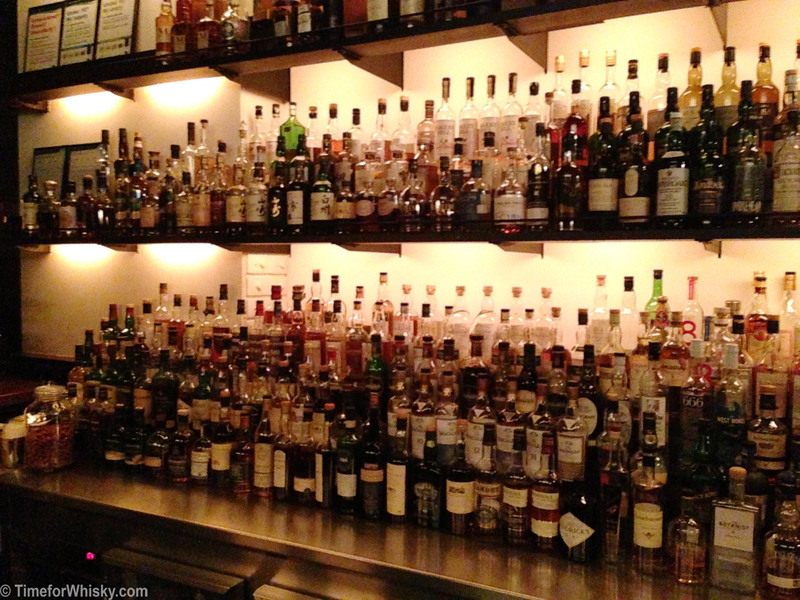 PR #19: Ardbeg Day Australia 2014 registration is NOW OPEN! Just to wrap up from our previous posts on Ardbeg Day 2014 and tasting notes on Ardbeg Auriverdes, a quick post to let you know that REGISTRATION FOR ARDBEG DAY AUSTRALIA 2014 (SYDNEY) IS NOW LIVE. ...and if you need any convincing, here's our review of 2013's event again. The Wild Rover are seemingly a roll with their "Campbell Corner Whiskey Co-Operative" (CCWC), keeping things true to their roots for their third session with some of the finest whiskies to come out of Ireland's Middleton Distillery. It's no secret that, as a style, I'm not a huge fan of the lighter, smoother triple distilled Irish whiskies (I'm also not a fan of Auchentoshan, for the same reason), but I figured if I was going to find one I liked, it was probably going to be here. Blend of pot still and grain whisky. Some unmalted barley giving it a creamy mouthfeel. Nose: Light, sandy, with vanilla, chalk and some sour notes. 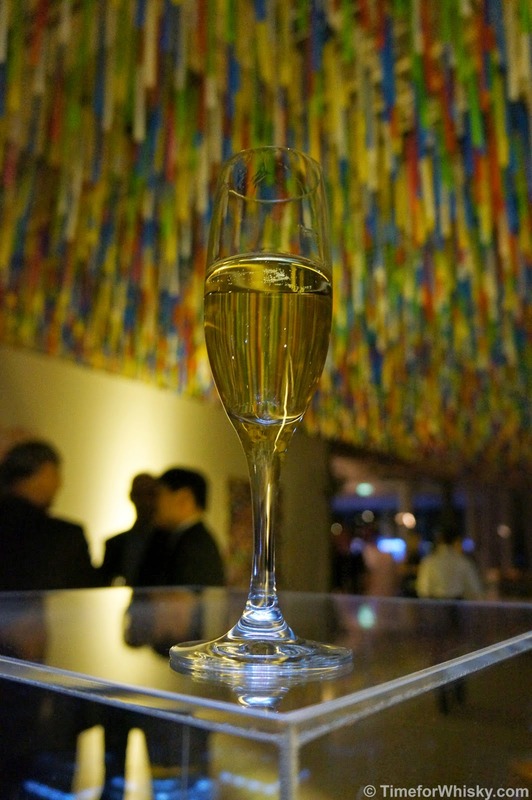 Palate: Light and sweet, smooth, sure, but almost too smooth. No real bite. Some banana notes. Would definitely go well in a lighter cocktail. Rating (on my very non-scientific scale): 86/100. Not entirely to my taste as a sipping whiskey. An interesting whiskey this one, one that's only been in Australia for ~9 months. One day each year, Middleton make a rare grain whiskey, which (unlike the other 364 days of the year) undergoes its first distillation in a pot still. That whiskey makes its way into this blend, along with other pot still malt whiskey. Nose: Smooth, vanilla and honey notes. Bourbon cask influence seems strong. Palate: Smooth, spicy, honey, cloves and raisins. Finish: Medium, sweet, with notes of vanilla and cinnamon. Rating (on my very non-scientific scale): 90/100. 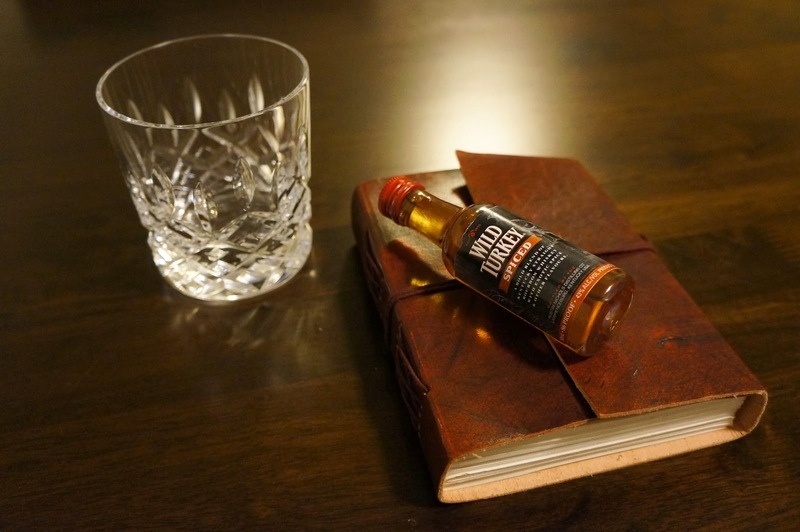 Consider this if you like a good, sweet Bourbon-influenced whiskey. 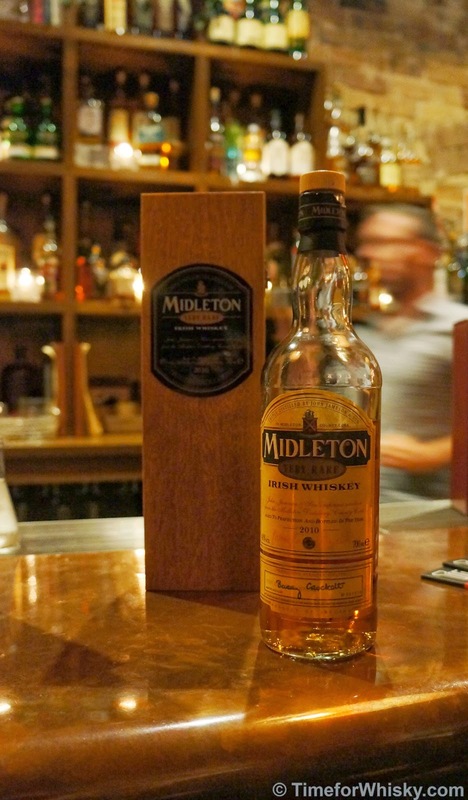 One of the first Irish whiskies I actually liked when I tried it years and years ago (before I was "into" whisky) at the Old Middleton Distillery in Dublin. Aged in a mixture of virgin French oak, and ex Bourbon and Sherry casks. Nose: Big, sweet vanilla hit, honey, cut grass, some blueberries. Palate: Light, caramel, some oak notes. Orange and toffee too. Finish: Shorter than the Select, longer than the original. Sweet with citrus hints. 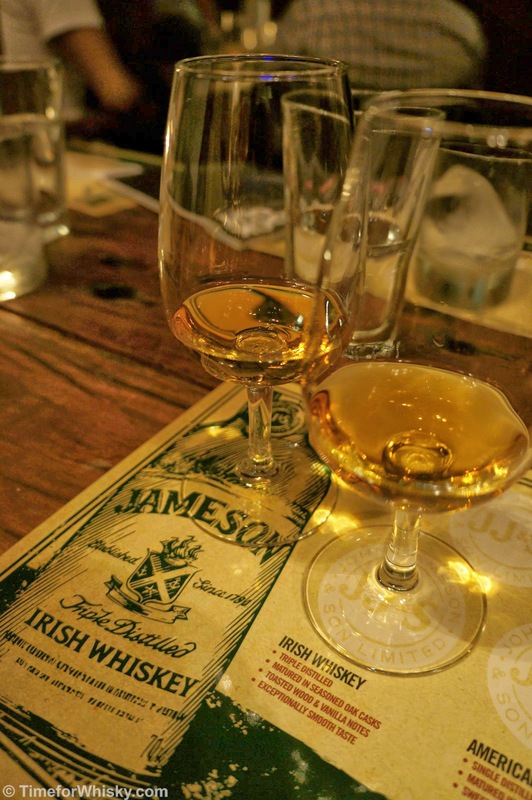 Nose: Rich, sweet, but "fuller" than the previous Jamesons. Some cinnamon. Palate: Very different to the Jamesons! Big oak influence. Salmon fillet? Really? I kept going back and that's what I got (and no, I hadn't recently eaten salmon fillet!). Some honey too. Finish: Short, oaky, and with those same inexplicable salmon notes! Rating (on my very non-scientific scale): 88/100. Not sure what was going with those Salmon notes..
A single pot still whiskey, aged for 12 years. Nose: Creamy, rich Christmas cake. Palate: Light (noticing a trend here?) but slightly meaty, with Christmas pudding notes. Finish: Short and meaty, but also rich and sweet. Limited to 5,000 bottles per year. $250/bottle, or free if anyone was willing to get a 'Sine Metu' tattoo on the night! Palate: Mouth filling, grainy, with some spice and cloves. None of the nose evident. Finish: Short to medium, with strong notes of cloves. A blend of grain whiskey aged in Bourbon barrels, and pot still whiskey aged in port pipes. Nose: Beautiful, rich, berries, sultanas, dates. Palate: Bigger mouthfeel - this is more like it. Slightly spicy, but still with those berry notes. Rating (on my very non-scientific scale): 93/100. The highlight for sure and a great end to the night. 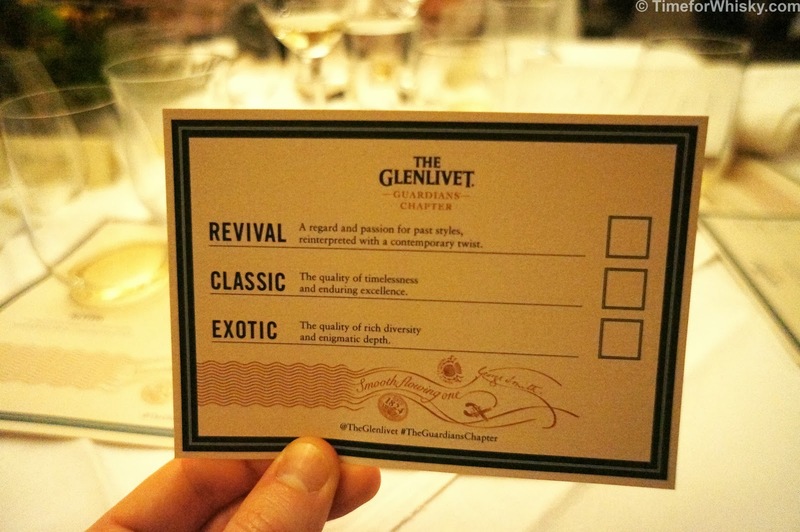 It was launched with much fanfare at an amazing degustation at Tetsuya's late last year, and just over 7 months later, after the 3 whiskies ("Classic", "Exotic" and "Revival") have made their way around the world and The Glenlivet's "Guardians" have cast their votes, the winning "Guardians' Chapter" whisky (Exotic) has been released. 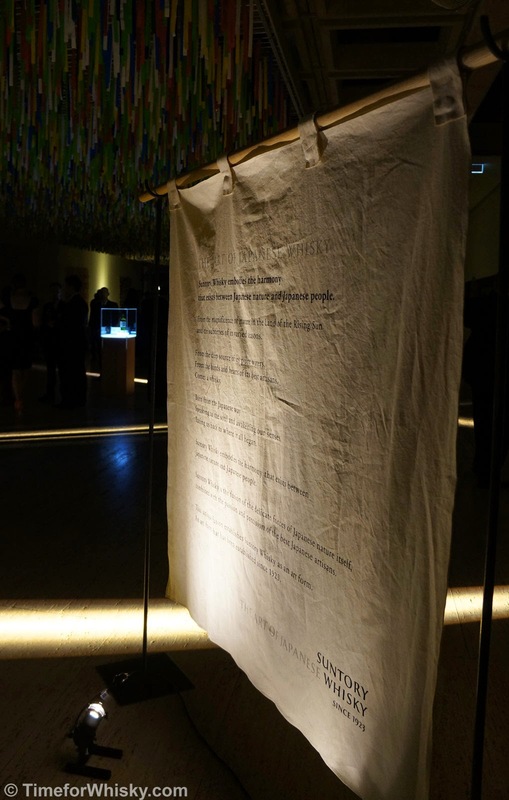 For those who didn't see the posts last year, The Glenlivet's "The Guardians' Chapter" is the world's first crowd-sourced single malt whisky, whereby fans around the world were given the opportunity to try three expressions, and vote on their favourite. The winning expression was bottled (limited to 2,000 cases globally) and sold through select bottle shops (in Australia, only Vintage Cellars). I, like many on the night, picked "Exotic" as my favourite (giving it 93/100), so I was just a little bit excited to hear that the world agreed, and it was selected as the winning expression. It was released officially last Thursday, for $114.99AUD. Considering that's the price of the 18yo, and this is quite a limited and unique release, that's good value in my books. 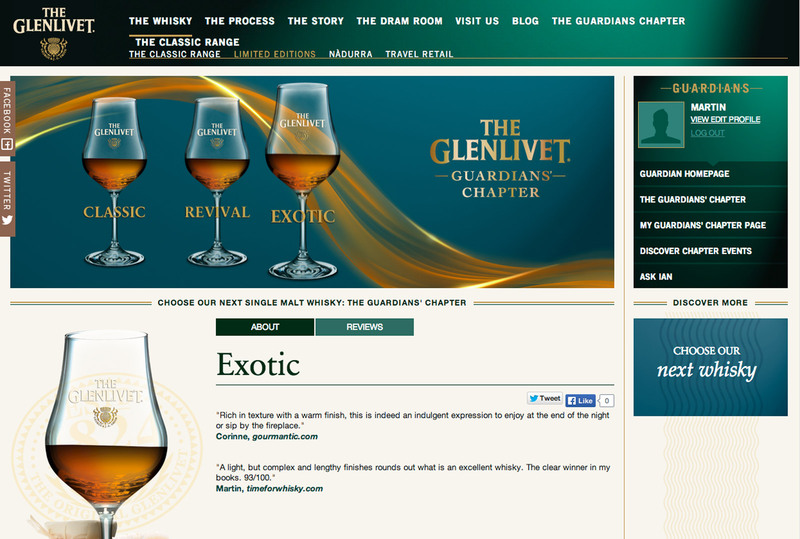 Here are the tasting notes I wrote back in September (some of which I was pleasantly surprised to see The Glenlivet had included on their official webpage for the whisky (screenshot from The Glenlivet's website below)! No word on how long it will stick around at Vintage Cellars, but given the limited release and good value, I'd guess not too long. 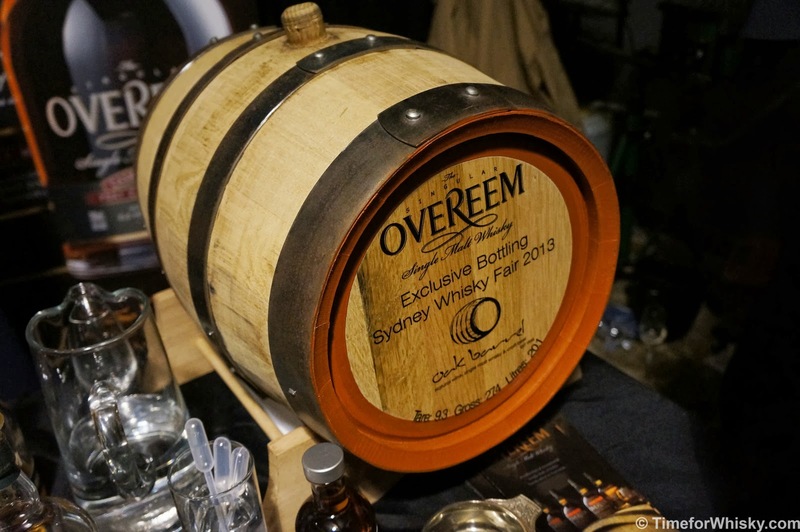 At the Oak Barrel Sydney Whisky Fair last year (see post here) we tried a great (and very unique) Overeem Port matured whisky which underwent further months maturation in a 5L barrel at The Oak Barrel's shop in Sydney. Turns out, Steph had bought me a bottle for my birthday a month later. Lucky man! Nose: Deep sherry notes, hint of smoke, hint of berries. Palate: More smoke. Sultanas, oat cakes, balsamic vinegar! Smoke reaches right to the back of the throat (but not in an unpleasant way). Finish: Long, smoky, with a hint of peppery spice towards the end. Rating (on my very non-scientific scale): 91/100. Add this to the list of "Overeem whiskies I really like" (which is every one I've ever tried).